Enjoying the backyard skating rink. With the winter deep-freeze is upon us, some homeowners are heating up plans for backyard skating rinks or already have them built! These rinks are neighbourhood fixtures for kids to team up for a game of hockey or to step on the ice for the first time. 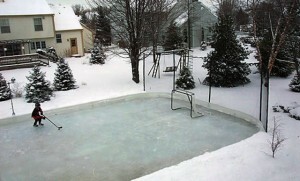 Despite the magical moments that an ice rink may bring, skating on a backyard ice rink involves the risk of injury and in turn liabilities for the rink-owner. Ice-skating is a great activity to fill the long winter months and a pastime that the whole family can enjoy with each other or friends. This being said, it’s important that the rights steps are taken in order to keep your rink as safe as possible for everyone using it. 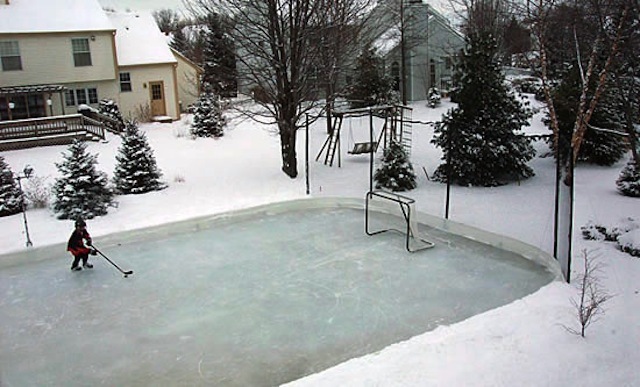 To keep things safe and you free of potential legalities, we suggest taking the following precautions when planning, making, or maintaining your home rink. Don’t skate alone: It’s important to always have at least two people present when using the rink and that adults are always actively supervising children who are using the ice. Protection: Make sure all skaters wear helmets! Also, extra padding is recommended for the younger skaters who are more prone to slips and falls when on the ice. Have lots of lighting: To ensure that everyone can see where they’re going when getting on/off the rink and while skating it’s very important that you put adequate lighting in place. In doing so, you need to also be sure that all extension cords are placed far away from skates, shovels, and water/ice. Think property: After flooding the rink, you should turn off water flow to outside taps to prevent frozen pipes with the colder temperatures. In addition, building the rink in an area that will drain away from the house when it thaws in the spring will help avoid water backups. Constant inspection: Before and in-between uses, check the surface for ridges and holes and frequently clear and flood the rink to keep it secure for all skaters. By using these tips into ice rink preparations and maintenance measures, skaters can glide through the winter chill and leave the season with warm memories!